This post is sponsored by Redbook and Signature by Levi Strauss & Co. ™ however all thoughts and opinions are my own. i am such a sucker for fall. i adore the colors of fall, the cold but not freezing temperatures, the leaves scattered on the ground, hot chocolate and last but not least the clothes! layering textures like knit with denim or fleece with jersey - these things make me smile. silly perhaps, but of all the seasons i love fall the most. 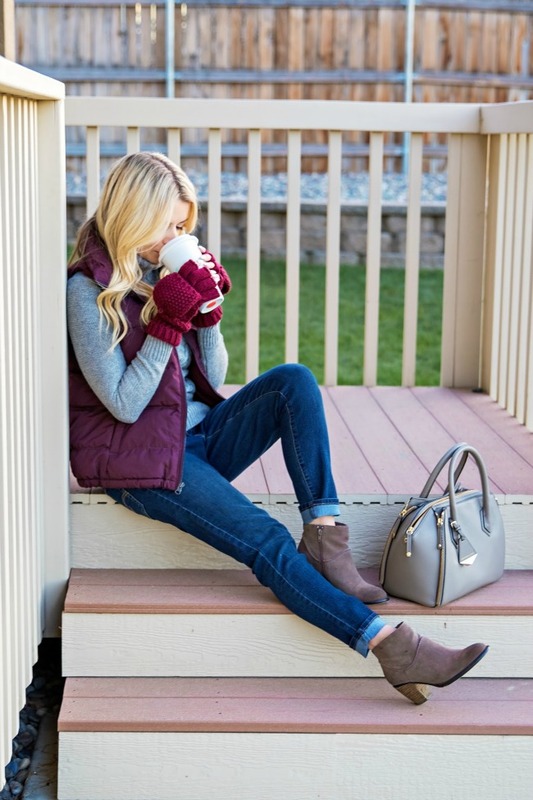 today's post features one of my favorite clothing combos: denim, cable knit and a puffy vest. i am pretty sure i could live in this clothing combination permanently. i partnered with Signature by Levi Strauss & Co. ™ to style some jeans from their line at Walmart. the Signature jeans fit, flatter and keep their shape all day. they are made with a premium, super-stretchy Simple Stretch denim that loves your body shape - whatever it may be! - so you'll look and feel Simply Amazing. there are three styles you can select from: Modern, Curvy and Plus and you can find all three in store at Walmart or at Walmart.com. Crafted with premium stretch denim you can comfortably move through your day in style. i selected the Simply Stretch Modern Skinny jean from Signature by Levi Strauss & Co.™ i chose this style because it is extra stretchy for all day comfort. it sits just below the waist, with a slim fit through the hip and thigh and a skinny leg opening. i paired this denim style with my favorite cable knit sweater in grey with a puffy vest in burgundy. grey and burgundy are a favorite color combination of mine and it looks great with the dark wash of the denim. interested in picking up a pair? right now if you visit the Signature by Levi Strauss & Co.™ Facebook page for your chance to win Signature by Levi Strauss & Co.™ jeans of your own! simply stylish. simply stretch denim. fits, flatters and loves your curves. Shop Signature by Levi Strauss & Co. ™ jeans at Walmart by clicking here.